First, the young upstarts known as Banditos﻿ lit up the club with raw, bluesy, punkified, tambourine-shaking, banjo-laced rock. Then the Old 97’s — venerated statesmen of the Republic of Alt-Country Meets Punk Rock — took us hip-shaking, innuendo-slinging, windmill-strumming into the wee hours of morning. First, the young upstarts known as Banditos lit up the club with raw, bluesy, tambourine-jangling southern rock. Then Old 97’s — the venerated statesmen of the Republic of Alt-Country Meets Punk — took us hip-shaking, innuendo-slinging, and windmill-strumming into the wee hours. It was one of those nights when you wanna say, “oh, to hell with it,” pack a bag, and follow the bands on down the road. The six-member Banditos hail from Birmingham and operate out of Nashville. 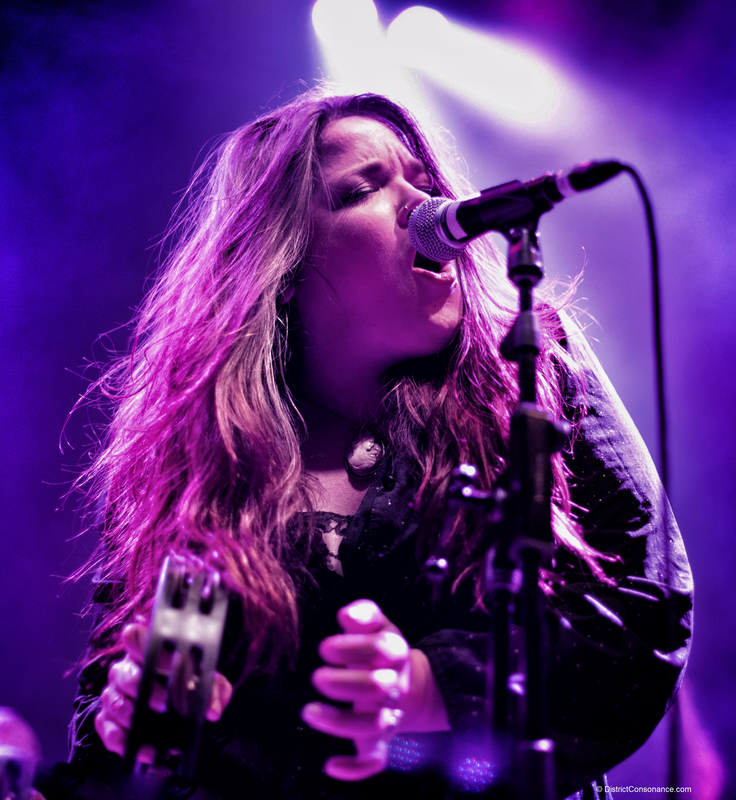 If you’re looking for new songs to play between cuts of Alabama Shakes and Drive-By Truckers, look no further — all that well-muscled, gritty, soulful goodness is right here. This is my day with Vandaveer, a music-making, life-observing, heartstring-bending group that I’ve followed since my first days in D.C. I join them for a jaunt up to New York City — my old hometown, the city of concrete and steel, where dreams are swallowed whole and dreams are set free, where restlessness is the only constant. Take notes, take photos, repeat to yourself: assemble, testify, preserve. But it’s not possible to be a detached observer. A single show is not a standalone thing but part of an organic whole. It necessarily embraces you. You feel like you’re moving through someone else’s strange, beautiful, ambiguous dream. The present is the past devouring the future. Music writers often describe songs as “evocative.” It’s a convenient shorthand – if a song doesn’t make your feel something, you probably won’t return to it. But it begs the question: evocative of what, exactly? For River Whyless’s music, I could go on for pages in response. The Asheville quartet is astonishingly adept at drawing you in through images of home – a woodshed, an attic, the skyline – all while unraveling the duality of wistfulness and sorrow that animates much of our storytelling: a yearning for the simple certainties of the past, tempered by melancholia over days gone by and days yet to come. That dialectic is expressed both lyrically and in the layers of polyrhythmic instrumentation and interwoven harmonies. The effect is simultaneously familiar and fresh, comforting and haunting. 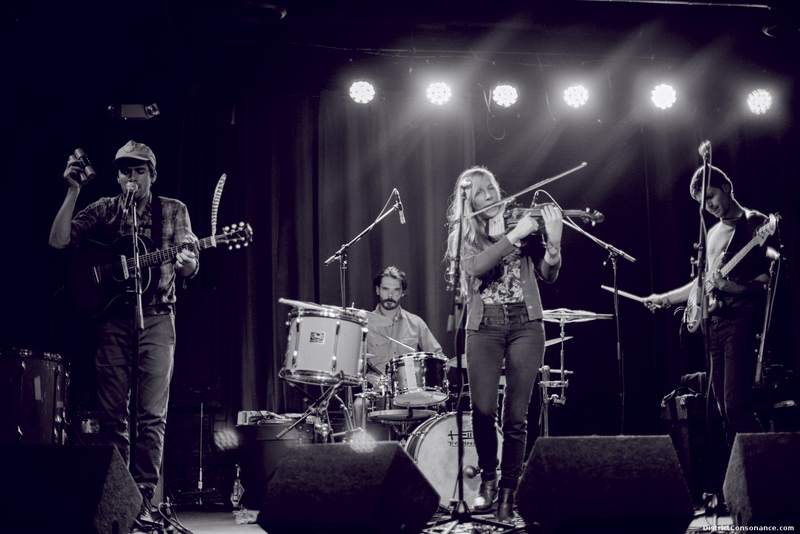 River Whyless is composed of Ryan O’Keefe (guitars, vocals), Halli Anderson (violin, vocals), Alex McWalters (drums, percussion) and Daniel Shearin (bass, vocals, harmonium, cello, banjo). If pressed to make comparisons, I’d say that their ethereal harmonies, delicately layered strings, and nimble, dynamic percussion remind me of Lord Huron, Fleet Foxes, and The Head and the Heart. And while their songs contain the appealing folk elements of those bands, River Whyless has found a musical identity that is wholly their own – baroque, folk, rock, global – shifting effortlessly from soft, shimmering ballads to spirited numbers built around handclaps and bass riffs. Listening to their eponymous new album, I am reminded of the first time I watched a campfire being built – glowing embers coaxed into dancing flames – alive, alight. Take “Miles of Skyline,” for instance. It opens with crisp, syncopated percussion that displays a technician’s precision without feeling cold or studied – it sounds tight, yet feels liberating. (As an aside, I would be happy just listening to an evening of Alex doing drum solos.) The violin flits in and out like an eastern songbird, with choice chirps played pizzicato. 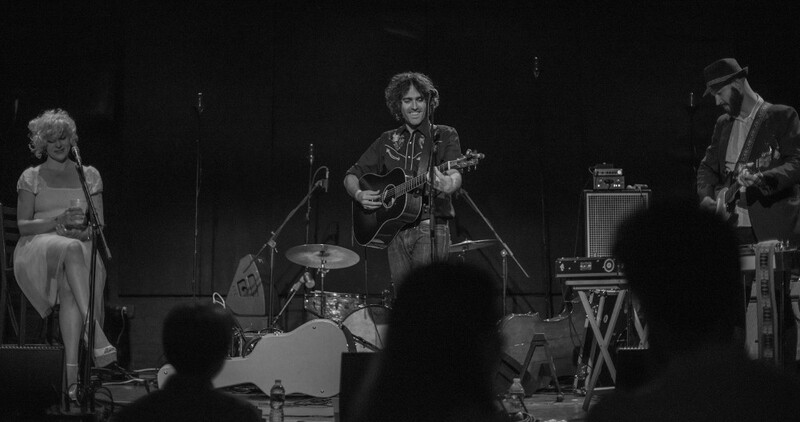 Though Ryan and Halli usually alternate lead on vocals, here, Daniel takes over, evoking in a bright and earnest tone the vistas that lend their name to the song. 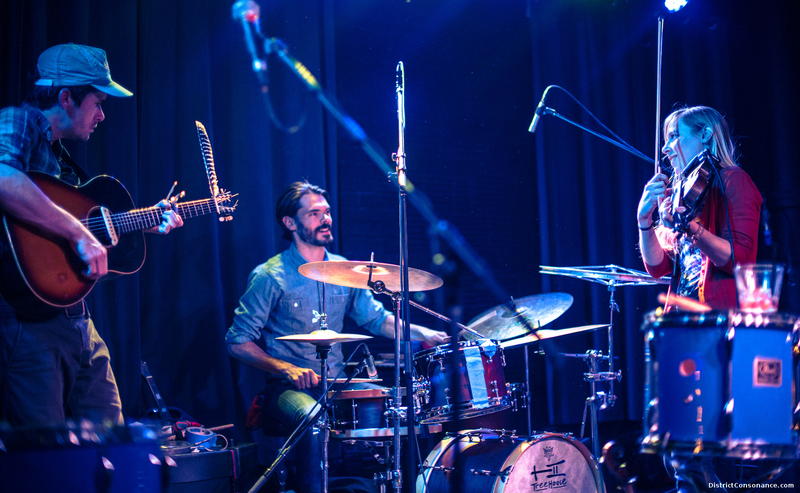 The Devil Makes Three’s music is garage-y ragtime, punkified blues, old n’ new timey without settling upon a particular era, and inspired as much by mountain music as by Preservation Hall jazz. Here’s your chance to win free tickets to a TDM3 show in your town. Update: Scroll down to hear the new, acoustic version of Hand Back Down. I love this stripped-down rendition. It’s as if you’re in the room with the trio and maybe, just maybe, you’ll get to do whiskey shots together after the song. 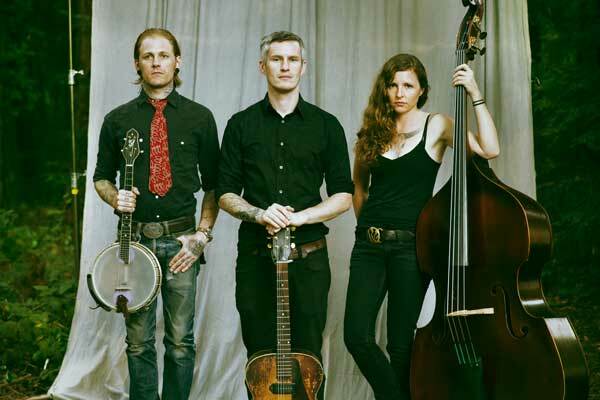 The Devil Makes Three draws from the storytelling traditions and acoustic string-band sound of old-time music and injects sardonic lyrics and an exuberant intensity that propels crowds to their feet to clap, stomp, and dance along. Their style cannot be cabined in a single genre and their lightning energy can hardly be contained within the bounds of a record. You really have to see them live to appreciate their magic — the finger-picked strings and surging harmonies wrapped around the drive of acoustic guitar and bass.